Pets are not permitted at this park. Go 4 miles north on U.S. Rt. 2. Swimming: There is a large, sandy beach with great swimming in Lake Champlain. Boating: There is a car-top boat launch, and boats (canoes and kayaks) can be rented through the park office. Fishing: Lots of great fishing in Lake Champlain. Picnicking: There are numerous picnic tables throughout the park. Stand-up Padding Boarding: SUP's are available to rent through the park. Volleyball: There are 2 volleyball nets in the day use field. Sand Bar State Park takes its name from a natural sandbar between South Hero Island in Grand Isle County and the town of Milton on the Vermont mainland. The park is on the mainland, or eastern end, of that sandbar. The sandbar itself is the result of the Lamoille River, over tens of thousands of years, washing sediment downstream from the present Lamoille Valley. The river borne material sank to the bottom as the river emptied into the lake, eventually filling the lake to create the marshland south and east of the park, and the sandbar to the west. Natural lake depths here, without the sandbar, would be over 150 feet. As it is, water depth now along the top of the sandbar to South Hero is only a couple of feet. Because of the shallow water, the route along the sandbar served as a ford from the mainland to the islands well before construction of the first bridge in 1850. Crossing that first toll bridge, built of rock, gravel, and logs laid corduroy-fashion through the marsh and along the bar, must have been an adventure. Narrow and much lower than the present causeway, it was often flooded and always needed major repairs after damage caused by shifting ice each spring. Even crossing today's wider, higher causeway, completed in 1959, can be an adventure when snow blowing across the frozen lake blocks visibility, or spray and water from crashing waves washes across the highway during storms when the lake is high. Marshland south and east of the park is part of the 1,000 acre Sand Bar Wildlife Refuge, established in 1920 and managed by the Vermont Department of Fish and Wildlife. Home to beaver, muskrats, racoons, and turtles, it's a seasonal stopover for a great variety of migratory waterfowl and other birds, a waterfowl nesting area, and spawning grounds for many of the lake's fish. Hunting, fishing, and trapping are not allowed on refuge land. Sand Bar State Park began in 1933 and was built by the Civilian Conservation Corps, or CCC, a nationwide public works program created during the great economic depression of the 1930s to provide jobs and training for thousands of unemployed. Many of the parks in this country, both state and national, trace their origins to the CCC era. 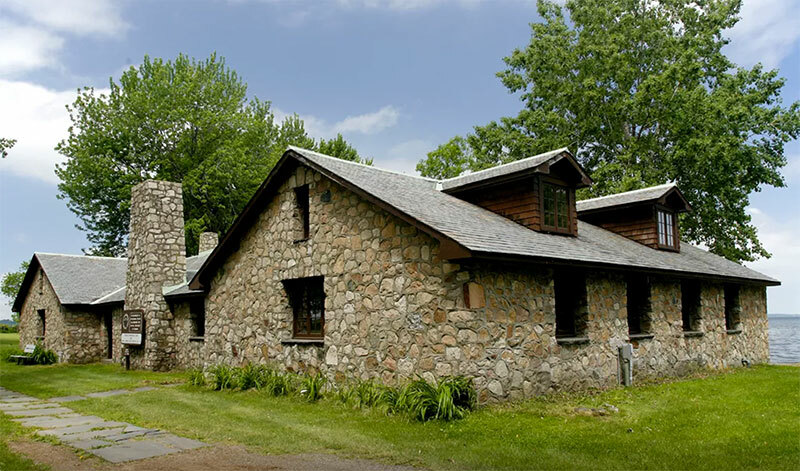 Sand Bar's stone bathhouse was a CCC project completed in 1935. The original 10-acre park included a small campground on the south side of the highway. As U.S. 2 became a busier and faster road, camping that close to it, and crossing back and forth, was neither desirable nor particularly safe. In 1970, a land swap gave the former campground, now a fishing access area, to the Fish and Wildlife Department and brought the park to its present 15-acre size. The useable length of the beach was doubled and the picnic area, newer bathhouse, and long parking lot were built as the park expanded east onto land acquired from the refuge. Today at Sand Bar, the smooth, sandy lake bottom remains shallow well out from shore, making this an ideal swimming spot for children. 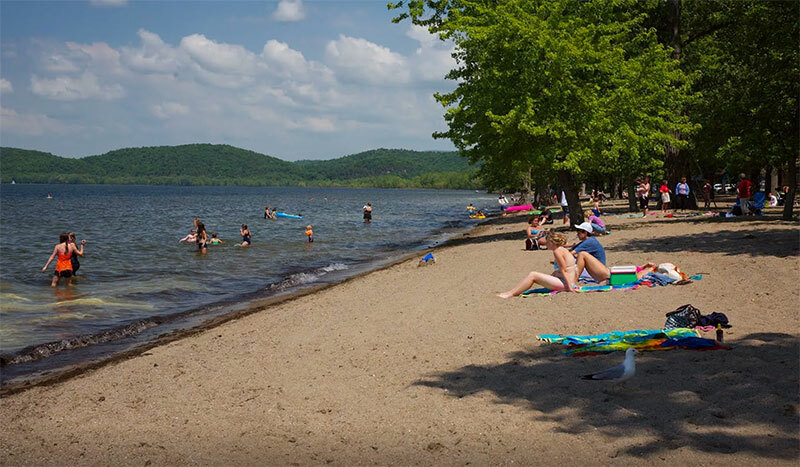 That, and the uninterrupted length of sandy beach, very high quality water in this section of the lake, and well-kept facilities in an attractive setting combine to make Sand Bar the most visited day park in the state. This park is open to day use visitors only. There is a two thousand foot (2000') sand beach offering great swimming. Canoes and kayaks can be rented through the park office, as can stand-up paddle boards. There are shaded and open picnic grounds with tables and cooking grills as well as a play area.